Norwegan photographer sells most of his stuff, buys and modifies a BMW R80 G/S, and spends the next 10 years and 250,000 miles traipsing around the globe. Along the way, he enountered enlightening, challenging and occasionally life-threatening events. Pederson became the first motorcyclist ever to ride through the infamous Darien Gap in Central America — 80 roadless miles of virtually impenetrable jungle. Even non-motorcyclists would like this one. 208-page "coffee table" sized book with over 200 amazing photos. 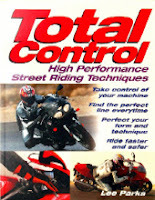 Street-survival skills from one of the foremost motorcycling safety gurus and author of the Proficient Motorcycling series of articles published over the years in Motorcycle Consumer News. Must-reads for all riders, but nobody should commute by bike without reading these. Note: Please feel free to recommend good reads by using the Comment button below.